I am an old man. Most of my life is behind me now. I am old but I'm happy. My world is filled with love despite spite of more that 3 decades of serious degenerative neurological disease (multiple sclerosis). A number of years ago, my youngest grandson came to visit for a week. He was three years old. We had a wonderful time doing nothing in particular. Each day we went out to explore various playgrounds, or a field, or collect rocks. He would sit on my lap and we whizzed around town in my electric wheelchair. As we travelled about we sang children's songs. He could really belt out rousing renditions of Itsy Bitsy Spider, Wheels on The Bus, and of course, that generational favourite, Twinkle, Twinkle Little Star. We would pass the big red church at the top of the hill in the center of my little French village, and I talked to my little guy about Jesus and things like the real meaning of Christmas and Easter. As each day came to a close and bedtime came, I read to him children stories from the Bible. He took it all in and accepted it as the truth. We read about how God made the world and when Jesus blessed the little children. We prayed for mommy and daddy, his brother and sister. When we said, “Amen”, he simply said "good night Papa", closed his eyes and went to sleep hugging his favourite stuffed animal. My grandson was completely secure in the care and love of his grandparents. He slept like – well, ... a baby. Just like my grandson's dependence and trust in me, I must trust and depend on God. In the previous chapter of Matthew, Jesus used the example of a small child to model discipleship. not childish thinking or behaviour. The word “turn” means to change course. It implies repentance. It is a crucial component to salvation and entrance into the Kingdom of heaven, along with faith, trust in, and dependence on Christ. Was Christ referring to receiving believers who are child-like in their Christian faith, or receiving small children in His name, receive Christ? Both. 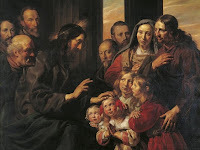 Jesus’ teaching on children in Matthew 19.13-16 affirms His love for children and closely followed his teaching on marriage, which precedes his teaching on money – but that’s fodder for a different blog entry. It is God’s intent that children be raised in the security of a family with a father and mother. That’s the model. In Matthew 19.4-6, Jesus states that marriage is between a man and a woman in agreement with God’s original plan for the conjugal union (Genesis 2.24). Biblical Christians must, therefore, conclude that children are best served by a family with a father and a mother. Both genders bear the image of God and should reflect different characteristics and attributes of God. Children need to see these loving parental differences to help develop a healthy understanding of God. The more both parents trust and depend on Christ, and love and serve each other, the more accurate the reflection of God’s characteristics. Conversely, the less trusting and dependent on Christ that the parents are ― the more distorted the image that is given to their children. As a grandparent, my role is to be supportive to the marriages of my adult children, to offer advice when sought, and to lovingly adore and encourage my grandchildren and give them a sense of their heritage. It’s not as easy as it may appear, especially for someone aggressive or dominant. by nature. I want to take charge! But that’s not my role, I am not in charge. I am only the grandfather. God’s way is that my adult children raise my grandchildren, not me. “At that time the disciples came to Jesus, saying, “Who is greatest in the kingdom of heaven?” Jesus called a little child to Him, set him in the midst of them, and said, “Assuredly, I say to you, unless you are converted and become as little children,﻿ you will by no means enter the kingdom of heaven.﻿ Therefore whoever humbles himself as this little child is the greatest in the kingdom of heaven. And whoever receives one little child like this in my name receives me."